(Updated for 2019) If you want to get any financial aid, you need to submit college financial aid applications such as the FAFSA and PROFILE. This is obviously a critical step: no application, no aid. But if you want to pay less for college, it certainly isn’t the first step. The fact is that the FAFSA is just one of the final steps of many in paying for college. I’m not talking about the savings account you were going to set up for your kids when they were little but never got around to. What I’m talking about are the things you need to know before students even start applying to colleges. 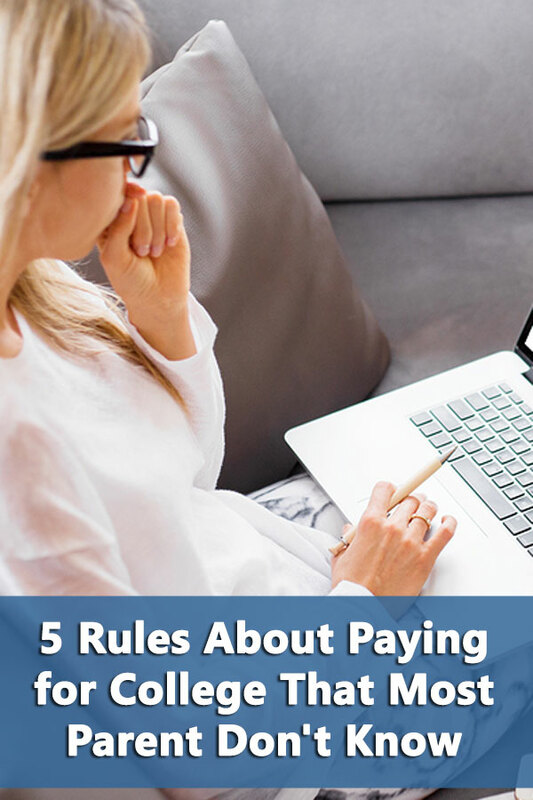 Before you even start making a college search list, much less worry about completing the FAFSA, you should know the following five things about paying for college. The FAFSA is no more the key to paying for college than the key to a safe deposit box is the key to a lifetime of riches. Yes, you need the key to open the box but what’s important is what is actually inside the box. In terms of college financial aid, what’s inside the box can vary tremendously from school to school. Completing the FAFSA is just a way of getting the key to the boxes you have selected through the college application process. If you didn’t choose the right schools, completing the FAFSA isn’t going to make generous amounts of financial aid appear. Unless you’re prepared to pay the full-cost of attendance yourself (or your student is applying to one of the few schools that provide generous aid to families with a high EFC), there’s no reason for the student to apply to “reach” schools. Since the school probably has plenty of students with similar qualifications applying, it has no incentive to provide merit aid or even meet demonstrated need. A survey by National Association for College Admission Counseling found that 34% of private schools that don’t meet 100% of financial need target less qualified students for gapping. Just as housing costs rise in major cities the closer you get to the downtown areas or any of the city’s other major attractions, college costs increase as you start approaching the northeast or the west coast. 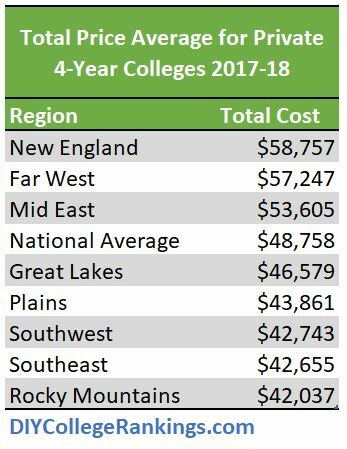 According Integrated Postsecondary Education Data System (IPEDS), Tuition, Fees, and Room and Board averaged $58,757 private institutions in New England while the Southeast states “only” averaged $42,655. That adds up to $60,000 over four years-could be the nice start to covering the cost of grad school. Furthermore, since the demand for colleges in New England is high, schools in the area have less incentive to provide merit aid. If you really think the only schools worth attending are in the northeast, be prepared to pay for the geography. You can argue whether or not student demand improves a university’s rankings or a school’s high rankings generates more student demand. In either case, if rankings are an indicator of demand, highly ranked colleges have less of an incentive to provide merit aid to students. However, that means that lower ranked schools are likely to be more generous with the financial aid to attract students away from the crowd. If you’re prepared to follow the road less traveled to increase your chances at financial aid, the rankings can show you the way. Don’t get me wrong. If you like playing with duck tape, go ahead and enter the Duck Tape scholarship contest. If you have time to write an essay for a $500 local scholarship, do it and you’ll have your books paid for. But if you really need a scholarship to pay for school, you’re looking in the wrong place. The largest amount of “gift” money for individual students comes from colleges and universities, not the local Rotary Club. 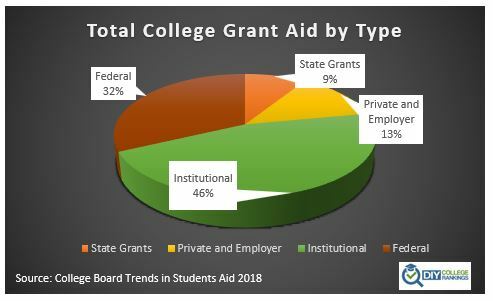 According to Trends in Student Aid 2018, institutional grants make up the largest source of “free” money representing 46% of all grant money. Federal grants, including veteran and military grants, is the second largest group at 32%. Private and Employer grants came in third at 13%. This includes employee tuition reimbursement programs. If you only have a limited amount of time to look for scholarships, your best bet is look for colleges that provide the most money.